In part 1 of the Living in the Flow of the Now Moment Series, I gave a simple, yet powerful technique for living in the now called savoring. Most all techniques on a personal growth path or spiritual path are meant to be simple. This doesn’t mean they are always easy, but when you find yourself confused or if things seem complicated, there is a good chance that your mind has run away with you and it is time to come back to self. Here is another simple, yet powerful tool you can use to stay in the precious now moment. I am writing this in the beautiful colonial town of San Miguel de Allende in Mexico where I have been living for two months. The first day I was here I was awestruck by all the bright colored doors and quaint cobble stone streets. Everywhere I looked I saw a picture I wanted to take with my camera. However, my camera wasn’t working. I was a little disappointed because I knew that the shear exquisiteness of the town would not impact me the way it did this first day. I knew that once I had become accustomed to what I was seeing, I would not notice it like I was now. This is because once the mind knows something, it has a tendency to not notice it like it did the first time. There is less awareness of it. The problem with this is that when doing the same routine people tend to become mind-less instead of mind-full. How many of us have arrived at work after commuting the same streets a hundred times realizing that we don’t even remember that morning’s drive to the office? The mind is so familiar with the route it has taken many times over that it simply checks out. This checking out is another way you put yourself out of the now moment. You are simply not present. You must be present in the now moment to experience it. After a time I decided to buy a new camera. 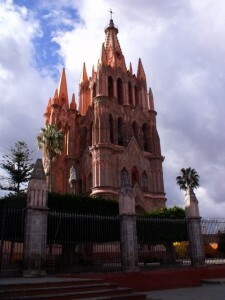 I found one I liked and went out to the streets of San Miguel to take photos. With the help of the new camera, I consciously chose to see San Miguel anew. I again saw the many beautiful wooden doors, each with their own style and color. I saw the reflections of the light as it danced off the coble stone streets of the City after a rain. I felt a sense of excitement and appreciation for the splendor of this place so full of history and hundreds of years of creative expression from its inhabitants. I was in the Flow of the now moment. A wonderful technique that puts you in the now moment is to find what is new in each moment. This is similar to what Buddhists call the beginner mind. In any given moment you can always find something that is new and fresh. Even if it is the same commute you have taken every day, you can find a way the light plays on the side of a building you hadn’t noticed before. Looking at things anew, puts you in the now moment. As you focus your awareness you become alert. You become present in the moment. The more you are present in the now, the more you enter the State of Flow.